- Ideal For Any Retail Business. 58mm wide thermal printers equipped with the capability of graphic logo and watermark, double-height printing for receipts, compressed printing mode for journal printing and a printing speed of 14 lines per second. Drop-in paper loading for easy handling of paper replacement. The key on the keyboard marked as HELP can print guidance messages on the receipt printer which contain answers to frequently asked questions such as how to program the time and date. Furthermore, these messages are customizable to meet individual needs. The function for direct entry of items not found eliminates the time necessary for searching for new items, thus reducing queues at the register. Items can be added to the master file directly using the associated department name. Direct and batch maintenance functions in the program mode are also available for further processing. The master file can handle newly introduced items according to your program and can be optimized using the inactive items report. A CF (Compact Flash) card can be used as a storage device for sales data to create your reports with spreadsheet software to make creating sales reports much easier. A CF card can store program data for backup purposes as well. 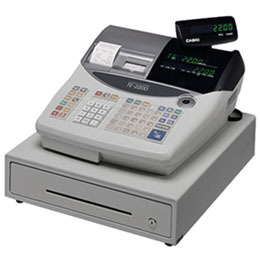 Two serial ports are available for direct connection to a PC, external remote printer, modem for connecting to head office, scanner for barcode reading, or slip printer for printing guest receipts or validation. Table control function Basic table control function is provided for small restaurants, cafés and bars. External printer can be configured for order or receipt printing. (c) copyright 2009 POS & Business Equipment LLC. "Business With a Personal Touch"